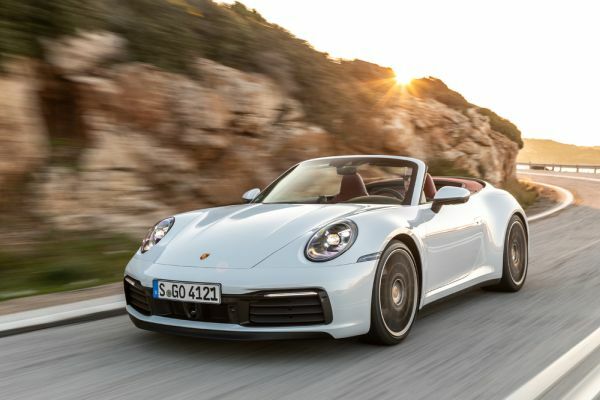 An eye-catching feature on the new 911 Carrera Cabriolet* is the unique panel bow convertible top. Porsche traditionally places high demands on the conver-tible top of the 911. As for all other 911 models in the past, this folding roof is therefore a completely own development. The innovative technology creates a coupé-like curved roof when the soft top is closed. With almost identical contours, the fabric roof elegantly spans the arc from the windscreen frame to the convertible top compartment lid. Without any visible bows underneath the fabric or any sections interrupting the flowing design of the classic 911 flyline, the new roof also has advantages when it comes to aerodynamics. Thanks to the new, lighter hydraulic roof drive, the soft top can be opened or closed in around 12 seconds at speeds up to 50 km/h. The innovative panel bow convertible top design makes it possible to achieve this previously unattainable form for fabric roofs. Here, the entire soft top – apart from the side sections – spans a rigid roof surface composed of individual segments that are seamlessly positioned next each other. The four elements are the front roof frame, two panel bows and the rear window. Like the other segments, the window frame is made of magnesium. All frame parts are connected kinematically, so that just one hydraulic cylinder is needed on each side to move the convertible top. For the locking mechanism, Porsche has opted for the proven electric central closure mechanism supported by side centering pins. There is no fixed connection between the panel bows and the soft top fabric, so that the four magnesium segments can fold flush over one another in the proven Z-folding mechanism when the roof is opened. This unique design means that the opened roof package consisting of the roof fabric, frame, panel bows and rear window, at just 23 centimetres high and around 55 centimetres long, requires very little storage space. While the front section of the roof remains visible in the open position, the sickle-shaped convertible top compartment lid covers the rear portion. The entire surface of the exterior fabric is lined with an insulating mat. So, when the top is closed, the vehicle occupants enjoy levels of climate and noise comfort that come very close to those of the Coupé. The integrated and electrically operated wind deflector ensures increased comfort in the 911 Carrera Cabriolet at higher speeds. The wind deflector is secured on a U-shaped support hoop, which is fully integrated in the rear area when folded down and therefore does not restrict the space on the rear seats. The hoop can be raised within two seconds at the push of a button and unrolls a mesh that is tensioned at right angles between the front seat backrests by a second movable frame element. The wind deflector can be opened and closed up to a speed of 120 km/h. When the top is open, it guarantees very good protection against draughts and minimum wind noise. 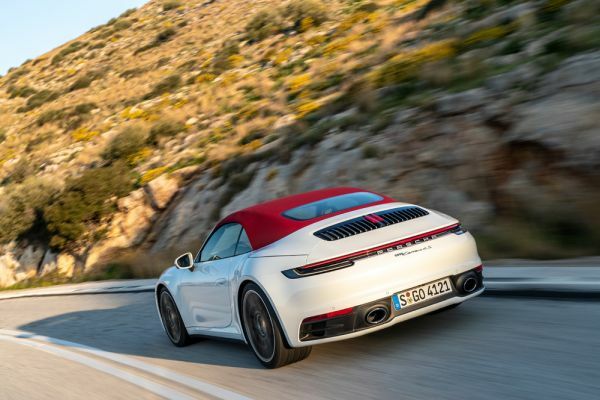 The basic elements of the aerodynamic concept for the 911 Carrera Cabriolet are the streamlined body surface contours, the convertible top, the enlarged variable rear spoiler and the cooling system with its adaptive air flaps at the front. The rear spoiler partly has a larger angle of attack to better suit the needs of the Cabriolet. The cross-sections of the air intakes and air outlets have been optimised to improve cooling air routing, enabling the 911 Carrera Cabriolet to maintain almost the Coupé’s cw value of 0.29 when the roof is closed – even though the cooling system has been adapted to the increased engine and braking power. The open 911 Carrera S has an automatic roll-over protection system. This essentially consists of a compact, self-supporting portal frame made of welded, high-strength extruded aluminium sections. With its high strength, the supporting frame is also used for body reinforcement: As such, the system helps to improve the Cabriolet’s torsional rigidity. In the event of an imminent roll-over, two newly developed cassette modules behind the rear seats are extended by spring pressure; triggering takes place pyrotechnically by a micro gas generator. If the convertible top is closed, a carbide metal pin on each of the two cassettes extends through the safety glass of the rear window. Accidental triggering is practically impossible because a high-precision airbag control unit with integrated roll-over sensor is responsible for sensing, actuation and continuous monitoring. This monitors every change in the body inclination, longitudinal and transverse acceleration as well as road contact.